Pakistan and China will jointly develop stealth Aircraft. This aircraft wouldn’t be detected in enemy radars and weapons and will reach to destination. There will be necessary modifications in JF-17 to make it stealth. The memorandum has been signed in the mid of last year. JF-17 is already the part of PAF with SQD 26 replacing old Chinese Aircrafts. The second SQD is under development. PAF will initially equip with 150 JF-17. Stealth would be essential part of future wars. America was the only producer of stealth Aircrafts which are F-22 and F35 but now Russia and India joint project on stealth. Where China is not behind and showed Jxx few month ago. PAF already have done their Homework to develop or buy stealth airraft. 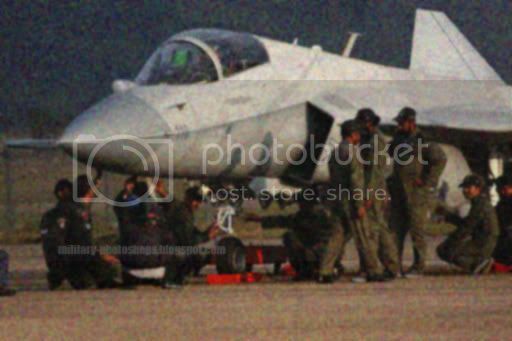 Jf17 here looks like a stealthier version,with all the ground personall around giving it a pre flight check. It seems to be developing more like an F-35 JSF . I will post HiRes versions of the photo later. Stay tuned.